Forum Description: From the lake, the field, the garden or the campfire! Family and ethnic recipes also encouraged! 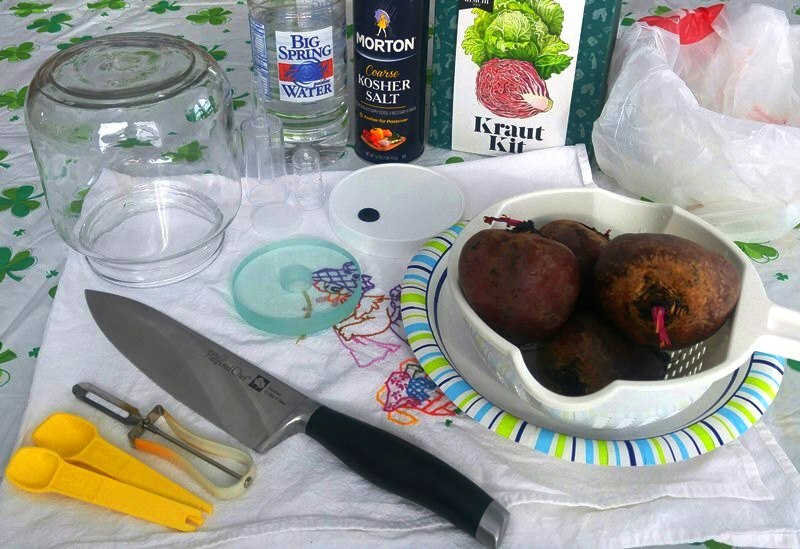 I have been looking into beet kvass, which is apparently a variation on traditional kvass that is normally made from rye bread. 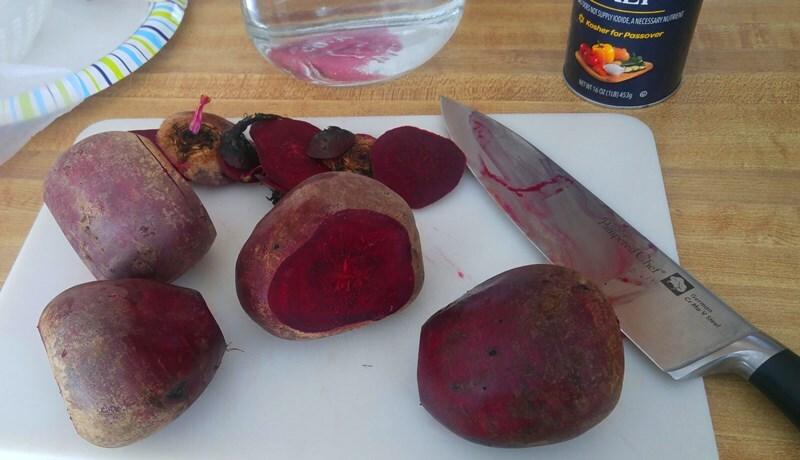 In this case, the juice from lacto-fermented beets is used, instead. I don't know much about it yet, but various internet sources say that it is a traditional thing in Russia and the surrounding regions. My own research indicates that it is made in Lithuania, where it is called gira; having said that, I would be surprised if it wasn't known in Russia, Ukraine and other nearby countries, as well. This looks incredibly easy to make, and by all descriptions it is both tasty and very healthy. Some recipes that I have found use a "starter culture" of whey or naturally-fermented sauerkraut juice, yet others do not; I think the culture simply gets the process started more quickly, but am not totally sure. One recipe even has you add some onion and cabbage to tone down the "beety" taste; another adds ginger for an interesting kick. 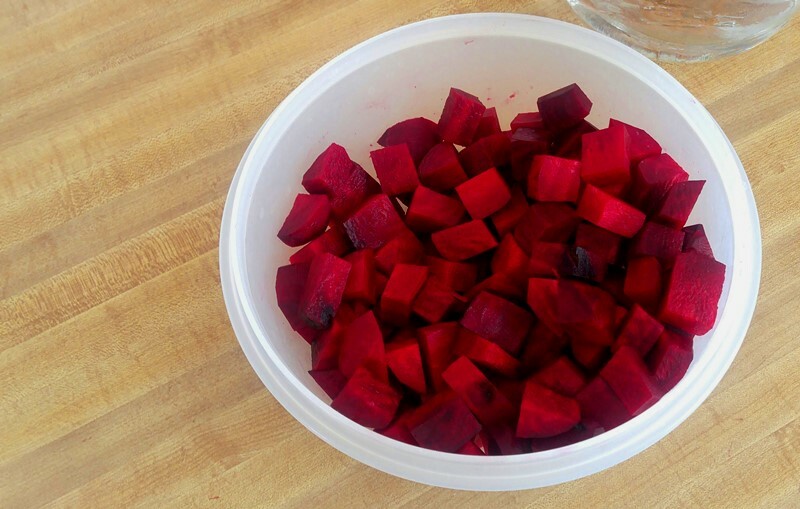 There is surely a use for the beets once they are fermented, as well, but having absolutely no experience with this yet, I cannot say for sure what that could be, other than simply eating them by themselves or possibly as part of a salad. 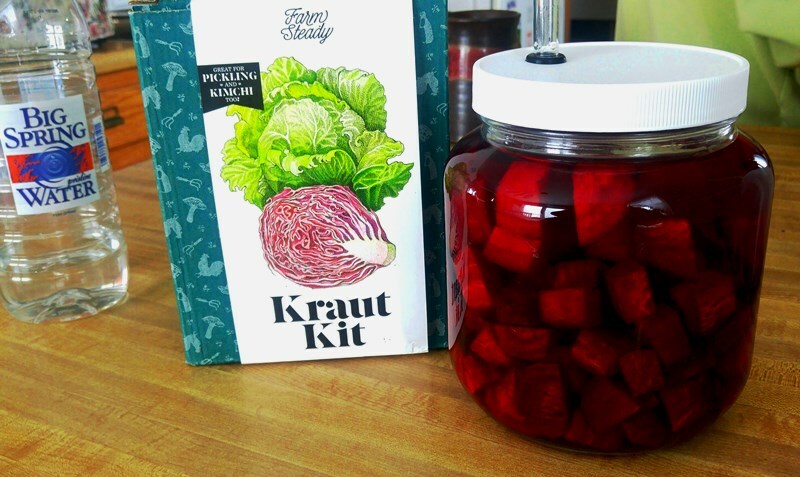 This kit is identical to their "Kraut Kit," which I have, and I am assuming that the latter will eventually be phased out in order to highlight the versatility of the former, which of course can also make sauerkraut just as easily; in fact, my dad had already just finished making his first batch of sauerkraut, which he pronounced to be most excellent. I also incorporated much of the information that I learned in my reading, following the sources listed above. 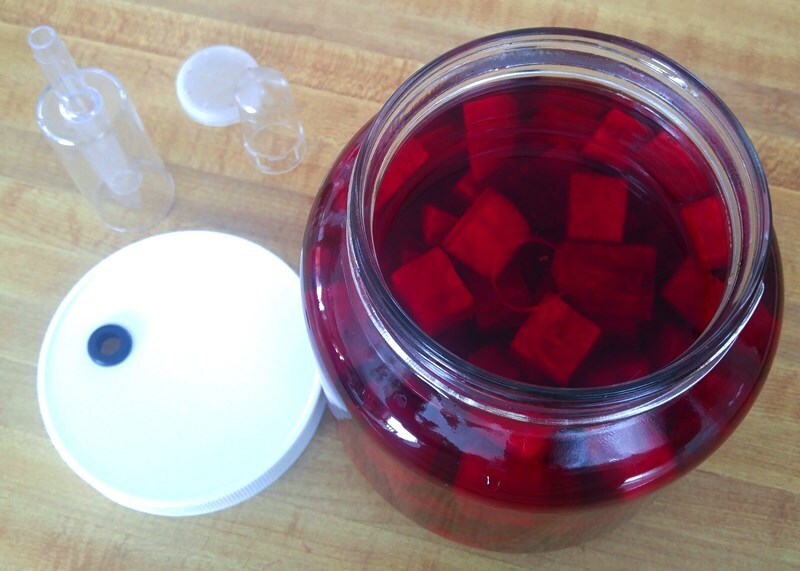 Everything here is self-explanatory, of course; 4 beets - cut into cubes - seemed to work perfectly for filling this fermentation jar. The only other thing I'll note is that my mother's tablespoon-sized measuring spoon, which has been in our family since the 1970s, has been a bit warped and partially-melted on one side since the 1980s. This may or may not have been my fault; I can't remember. In any case, It is probably still accurate, or at least "close enough," but I decided to just use the teaspoon to do my measuring. I don't know why I also included the half-teaspoon, but there it is. 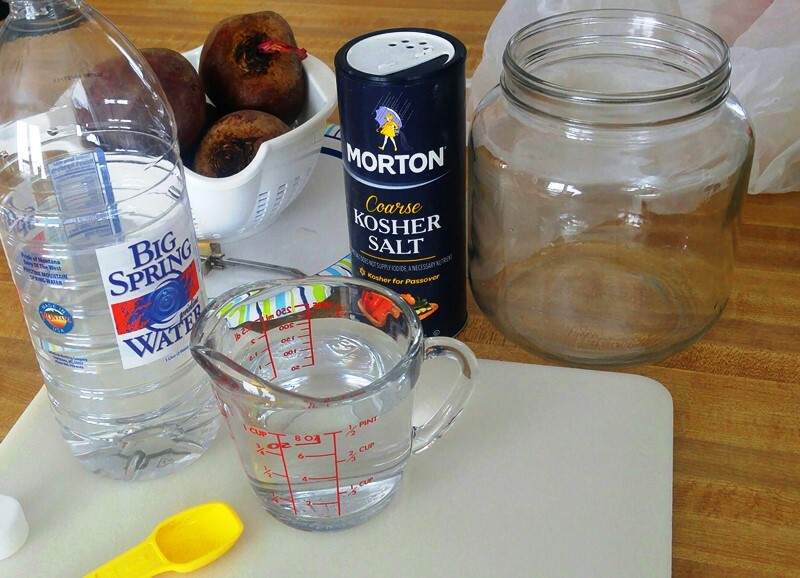 Obviously, other non-iodised salt such as canning or sea salt can be used; however, because of the different densities that different salts have, I do not at this time know what proportions should be used for those salts. Sooner or later, I will find out and will post about it. I considered slicing them into "chips," but ultimately chose not to. One or two of the cubes escaped, and I pushed them back down under the weight. This is where slicing them into chips might have been handy so that they would be easier to keep beneath the weight; however, I do not know if there would have been any negative effects to doing so. As you can see, the water was already starting to turn a deep, beautiful red. Once I was finished helping my dad, I carefully transported the beets back home and put them on the top shelf of our bedroom closet, where the temperatures are fairly stable and in the 60- to 70-degree range that is advised for good fermentation. As for how long the kvass should ferment, the sources vary. If using whey or some other "starter," some sources advise 2 to 4 days; other sources, with no starter, say that fermentation times can range from "at least a week" to 2 weeks. FarmSteady, in their general instructions for fermenting vegetables, prescribes "5 to 7 days." Nearly all sources add the caveat "...or until desired flavour is reached." With all of this in mind, I'll check my kvass after a week, and go from there. My experience with lacto-fermenting so far has taught me that, for whatever reason, things take a little longer than the "recipes" say that they will, so I am going to guess that this will take 2 weeks at a minimum; having said that, all we are after here is the fermented juice, not so much the vegetables themselves, so we shall see. Early indications are that this was a pretty good success! On Saturday, 2 weeks after starting this, I transferred the kvass/gira t from the fermentation jar. I had about 1.5 quarts - maybe a little less - of lacto-fermented beet juice; most of this went into a canning jar (filled almost to the brim) and into the refrigerator, but I did hold enough back for a good sample. I don't have a photo, but it is dark-red (of course) with no visible sediment that I can see. The smell was a bit tangy-sour, with just a bit of earthiness and a lot of beet. The taste was much the same, tangy-sour, fully of good beety flavor, and only the barest hint of earthiness. In a lot of ways, it tasted almost exactly as I expected it to. From what I can see, this would bring the amount of salt down a little bit, but I am guessing that the trick here would be in knowing the "correct" percentage of brine that one wants to employ. The ratio I sued above is good for an "all-purpose" brine, and should be seen as a go-to, I think, unless there is a stated reason not to use it, or a specific percentage cited in a recipe. 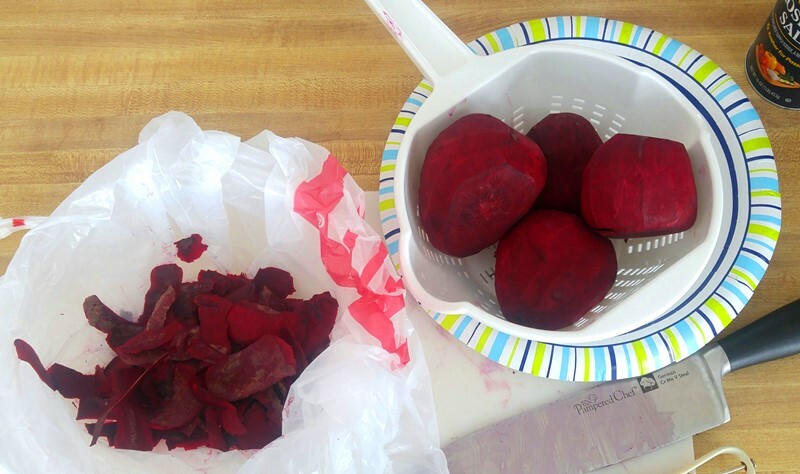 As for the leftover beets, they can indeed be used to make a second batch, although that batch has been described as "weaker." in our case, The Beautiful Mrs. Tas commandeered quite a few of them for eating, as she is a good Slovak girl. They were raw and "crunchy," so she asked me to boil them for a few minutes to soften them up. I saved the majority of them for use in a possible borshch-like stew in the near future, depending on what our larder looks like this coming weekend. That's all I have for now, other than that I do like this, and will do it again. I'll try to post a photo at some time in the future; but in all honestly, it looks exactly like one would expect it to look.